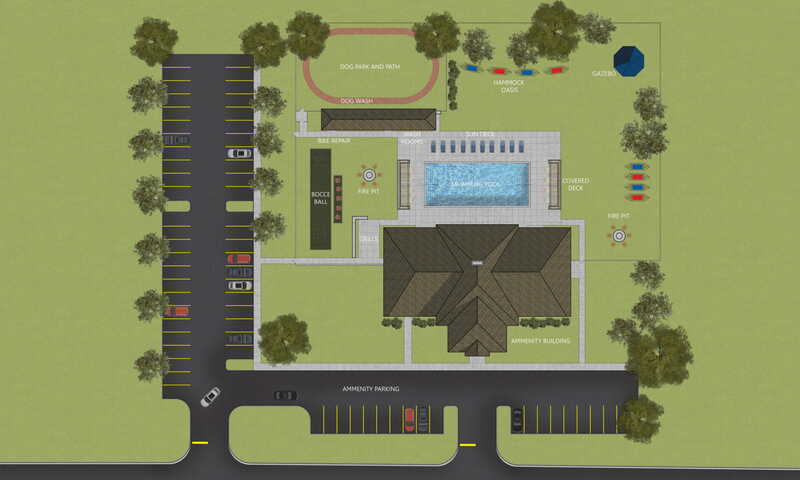 CHAMPAIGN, IL – Regency Multifamily, one of Champaign’s largest real estate developers and managers, announced it has started construction on the next phase of a new luxury resort-style community near I-57 and Curtis Road interchange in southwest Champaign located on Palmer Drive. The Legends Apartments, a mix of one-, two-, and three-bedroom floor plans, is located adjacent to The Legends Golf Course and across the street from Carle at The Fields concourse. A groundbreaking ceremony took place Wednesday, November 8, 2017. The new apartment homes will be available for move in this summer. The Legends community will feature a beautifully appointed 6,700 square foot clubhouse with a custom high-definition golf simulator programmed with famous courses from around the world. Other amenities include a conference room, two gathering/party rooms, a game room with pool table and gift-wrapping room. The high-tech fitness center includes on-demand yoga/spin classes from national renowned instructors. All residents enjoy free golf at the Legends 9-hole executive golf course, plus a 70-foot resort-style swimming pool, two oversized fire pits, a gazebo, and a hammock oasis. The pet and bike-friendly community has a 15,000 sq. ft architecturally designed dog-park with an indoor pet washing station and bike maintenance room. The apartment homes include a vibrant new concept in apartment living and have open floor plans, hardwood floors, nine-foot ceilings, washer/dryer in each apartment, large kitchens with an island, granite countertops and stainless steel appliances. For more information or to schedule a tour of the model go to TheLegendsChampaign.com. The Legends Apartments is a Regency Multifamily community. Regency owns, manages and develops apartment communities throughout the Midwest. Since 2007 Regency Multifamily has been awarded the National Customer Service Award for Excellence. The Award, presented by CEL & Associates, Inc. recognizes companies whose management performance and commitment to the highest level and quality of service are considered to be the “Best in the Industry”. Go to Regency-Multifamily.com for more information.